As well as giving Android Wear a big helping hand, some of Fossil Group's brands have spent the last year pumping out hybrid smartwatches, DKNY, Kate Spade, Misfit and Skagen included. Now, women's designer watch powerhouse Michele is getting involved, with the Michele Connected hybrid. Women's smartwatches have been slower to market, so we're especially glad to see Michele, but it also helps that it's made a really beautiful hybrid. And as you may have already guessed, it's going to cost you a pretty penny. Naturally, this is a smaller hybrid, measuring in at 38mm wide, but it has just enough weight to give it that luxury feel – in case the alligator strap didn't make that obvious. The case design looks a little similar to Michele's Belmore collection, but comes in just 1mm larger, and of course has the added smarts. Along with the black, gold, silver and rose gold case options, Michele comes with a range of strap colours too – white, navy, grey and black – but you'll be able to swap in any 18mm band of your choosing if the ones included aren't your vibe. 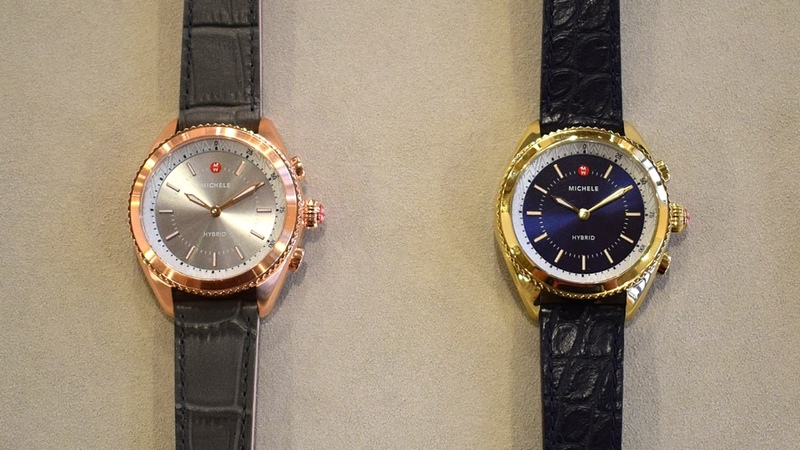 Like other watches in Fossil's brand portfolio, the Michele offers notifications that are conveyed through hand movements. You can assign contacts to different numbers on the clock, and should you get a text or call the watch will vibrate and the hands will turn to point to tell you who it is. 2 o'clock? Text from Dad! It's the same system we've seen working across most of the other hybrids. Some others have combined the clock with sub-dials or color wheels to distinguish different notification types, but the Michele has just one clock face. You do also have three buttons to use here, and these can be assigned to perform different tasks. You could assign one to remotely control the camera shutter on your phone, or pause the current track you're listening to. Again, this has become part of the Fossil Group's hybrid DNA, and we've found the button features generally bring more value than the notifications, which sometimes require a bit of decoding (and obviously don't display any content on the face). Being able to remotely ring your phone when you lose it down the back of the couch, for example, has saved us on more than one occasion. Then there's the activity tracking, but this is limited to just step tracking and basic accelerometer-based sleep tracking. If these things are important to you, and you don't mind wearing your watch to bed (or foregoing a bit of accuracy), then great. But if you're after anything meaty by way of fitness features, you're looking in the wrong place. If it's a good battery life you're after, you're laughing – Michele quotes four to six months of it. Functionally, then, the Michele Connected doesn't distinguish itself from the rest of the Fossil bunch, and that's fine. More important is that there's another option for women, one from a big luxury name, and one we reckon a lot of people are going to like. It's also available right now, for $495.